and follow-up, which directly impacts and correlates your medical billing? A/R describes the steps that are necessary to monitor and pursue the collection of payments from insurance payers. Our proficient team – by easily monitoring the performance of A/R efforts and taking correct measures – can provide the early warning sign of any potential collection problems. MDofficeManager’s A/R team is the preferred option for your A/R follow-up and mgmt.. Auditing claims to reduce the aging/claims rejection Our audit process is linked to the principles of a continuous quality check at every level. In addition to conventional auditing methods, we follow six sigma techniques to identify errors and reveal solutions by tracing the main causes. This assists to submit clean claims. As a result, increased income! Rectifying errors by billing the claims in a timely manner Our proficient team understands the criteria of the mistakes. We scrutinize for further detailing depending on the complexity of the claims. Stringent payer follow-up We run various reports by payer and by patients to determine the outstanding amount, and then address the issues proactively. Follow-up is carried out aggressively by calling to gain the denial issues and determining a resolution. We process denials, submission and re-submission rigorously until payments are received. Submission and re-submission of claims are prioritized to yield superior and rapid collection. High charge / high aging These claims would be processed on a priority basis as the claims need to be followed up on before exceeding the filing deadline. High charge / low aging The next focus would be on high dollar claims with low age as the chances of gaining collections increase. Low charge / low aging These claims have a higher probability of collection. Low charge / high aging These claims are given last priority as these claims have a lower probability of collection. Appealing For unsettled disputed claims we submit a request to the payer, in order to bring attention to the incorrectly denied claims. Through an appeal process, we ensure that physicians are reimbursed for their provided services. Detailed reporting Monthly reports are extracted from MDofficeManager electronically. These reports provide accurate projections regarding the anticipated cash flow of the practice. The customized report option gives an estimated collection for the services provided. MDofficeManager also offers various options to the user per defined reports that list detailed information, as far as, each unpaid claim. With electronic payments, providers are reimbursed on a real-time basis reducing bad debt and a large accounts-receivable inventory. Higher collection rates at minimal time. Ensures that providers bill properly and are paid properly and on-time. Providing end-to-end solutions at lower rates. The electronic storage of highly secure and private patient data is readily accessible by the appropriate individuals across the institutions and geographical areas. MDofficeManager provides easy-to-use electronic interfacing and one-source of retrieving a master database. by calling at 812-248-9206 There is no commitment or obligation. In a nutshell, outsourcing your AR and Denial Management functions to MDofficeManager team will net you greater income – minimizing lost reimbursements by maximizing your effectiveness at collecting unpaid claims. It’s the right value equation to get you the highest possible return on investment – it’s a service that more than pays for itself. AR Management: MDofficeManager takes care of all the critical functions involved in AR management including filing of appeals, assessing insurance low pays, updating insurance contracts, managing unapplied balances, managing refunds, and processing patient statements and delinquency letters. The Right Value Equation: AR & Denial Management is extremely time-consuming and most practices (and billing companies) do not devote sufficient resources to adequately pursue maximum reimbursement services are highly functionalized and supported by software tools that typically produce a significant net gain in reimbursement for each client practice, making the decision to outsource this function a clearly positive value equation. 24/7 Help Desk: MDofficeManager’s team of experts is always available to offer immediate support to you and your staff no matter what the issue or problem may be. Denial Management: Minimize lost reimbursements and denials with highly efficient systems and services designed to meet your needs. Maximize your effectiveness at collecting unpaid claims. MDofficeManager expertly tracks and manages timely follow up on all unpaid claims, ensuring that no time is lost on pursuing every reimbursement possibility. Workflow and Reporting: MDofficeManager dedicates specific staff, well trained and experienced in denial management, to undertake this very important work. The software tools used by Precision’s staff allow for well managed and timely follow-up on all unpaid claims. 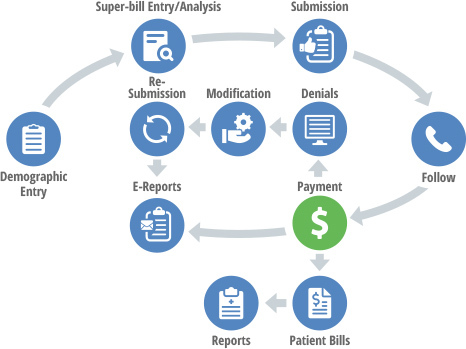 These same workflow tools allow for extremely detailed and useful reporting, making work done on denied claims very visible and make accountable all the resources devoted to this task.